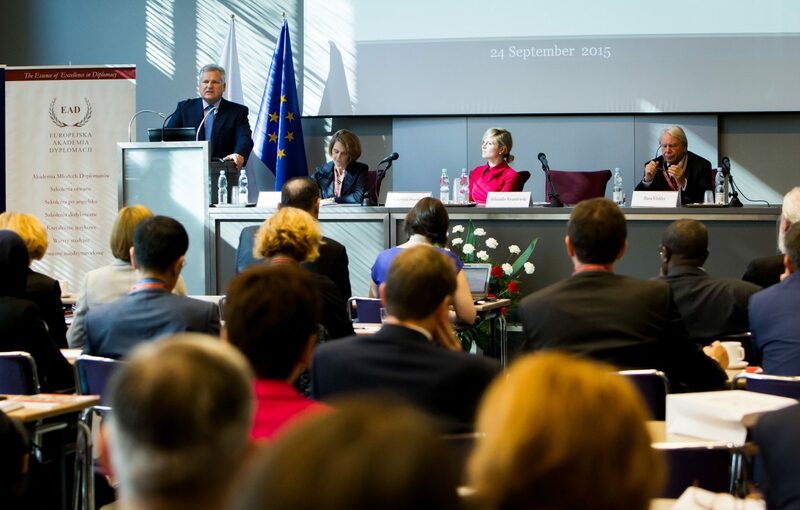 On 23 – 25 September 2015 the European Academy of Diplomacy in cooperation with the National School of Public Administration, Diplomatic Academy in Vienna and Georgetown University organized the International Forum on Diplomatic Training – 42nd meeting of Deans and Directors of Diplomatic Academies and Institutes of International Relations. The forum gathered representatives The forum gathered representatives from 6 continents and more than 50 diplomatic academies for an intense 3-days program that discussed new trends and challenges in preparing future diplomats for work in a rapidly changing international environment. Guest speakers included President Aleksander Kwaśniewski, Prime Minister Włodzimierz Cimoszewicz and Minister Andrzej Olechowski. Report from the 2015 IFDT can be found HERE. Scholarships for Academy of Young Diplomats!